Product based on high resistance cement, selected aggregates, additives and synthetic resins which give excellent bonding, good workability and resistance to ageing. To be applied indoors and outdoors. Façades. Suitable for all types of ceramic tiles, marble, granite and natural stone. 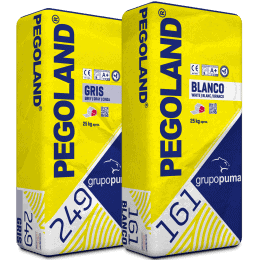 Highly recommended for large format tiles. Laying of tiles over cementitious waterproofing from the Morcem Dry range. To tile large areas with intense traffic and floors with underfloor heating, cooling chambers and overlapping.  Suitable for adhesion on all types of plasterboard drywalls. Ceramic pavements for interior and exterior. Do not apply on clay or on paint. Spread the mixed product on the substrate with a trowel to a maximum surface area of 2m². Respect the construction joints (expansion, shrinkage, fraction, perimeter corner joints) and between tiles (minimum of 2 mm inside and 5 mm outside). Under extreme weather conditions (gusty winds or high temperatures) drying may occur faster. 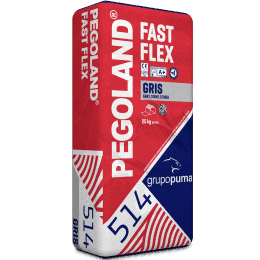 Tiled areas of walls and floors above 50 m2 indoor and 30 m2 outdoor or elongated more than 15 linear m it is recommended to divide them with joints filled with a deformable grout among PUMALASTIC range. In case of Indoor floor tiled areas larger than 15 m² it is recommended to leave a free perimeter joint between the tiles and the wall or pillar of about 5 mm hidden by the plinth. These joints must be filled with a deformable grout among PUMALASTIC range. On floors with underfloor heating; this should be switched off at least 48 hours prior to use and should be switched back on again gradually after at least 7 days of installing the flooring and pointing operation. Check that the gypsum board is firmly fixed before applying on it. 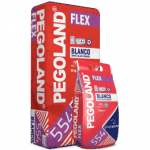 For slate and substrates that are sensitive to humidity use PEGOLAND FLEX RECORD. 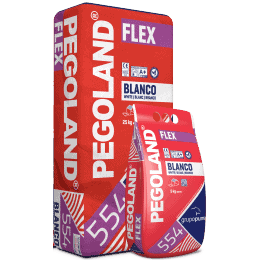 For gypsum based substrates, use PEGOLAND ESPECIAL YESO o PEGOLAND PORCELANICO YESO, avoiding slaked or poor plaster. On façades and exterior facings, the material must be secured with mechanical systems when any of the following conditions are not complied with: inferior format of 2400 cm², neither side larger than 60 cm, weight less than 40 kg/m² or height less than 3 metres. For use in cooling chambers; these should remain switched off until the correct adhesive curing has been obtained, at least 7 days depending on ambient conditions. The swimming pool can be refilled after 7 days of applying the adhesive. The watertightness of the swimmingpool must be guaranteed by the underlying concrete structure. In case of tiles reinforced with fiberglass mesh on their back, ask the technical department. Do not use the technique known as by globs. Working and setting times of the adhesive depend on the temperature, air streams, and the absorption of tiles and substrates.